Nothing much has happened in a while. At least not until the last couple of weeks, but now things are happening. 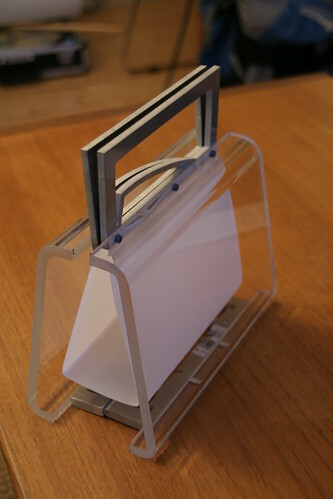 I’ve made the first real prototype, and it has come as far as it ever will. The design has a lot of issues, but has also given me some good answers and new ideas. The size is a number too big. The thickness of the acrylic sheets + the size make it look a bit lumpy. The weight is too high. I think I’ve made it a bit too solid. The hinges cannot be rounded with a router. 2 out of 3 was ruined doing this. Black end walls for the lining wasn’t looking too good. And sewing that kind of plastic sheets has proven impossible. Small inaccuracies all over accumulates and make the handles come together with a slight angle. Forget screws made out of aluminum. They don’t have the strenght needed. Too bad, because they can be colored with the same process as handle and hinges, getting the same color and finish. The design has the potential to look really good. The idea that design elements in the handle repeated on the side of the purse may work. The lining looks like it floats in thin air. Could be reinforced with lights. It is possible to create threads in acrylic, and the screw/acrylic joints seems strong enough. The jig for drilling at a right angle for the acrylic sheet bended 81 degrees works well. The lining should be lighted up from within. The LED should be integrated into the bottom of the handle. Creating a pattern on the inside of the acrylic walls. 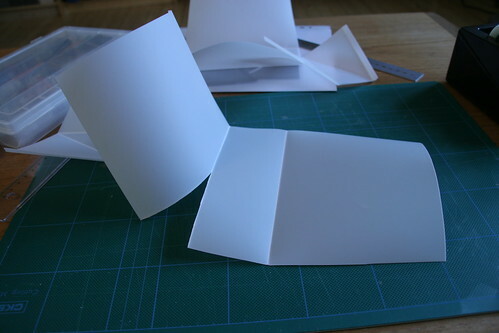 Origami: Make the lining from a semi-rigid plastic sheet. Should have clear folds to give it a origami look. Make the outer shell 3 mm thick and glue a 5 mm thick sheet with the design elements on the inside. 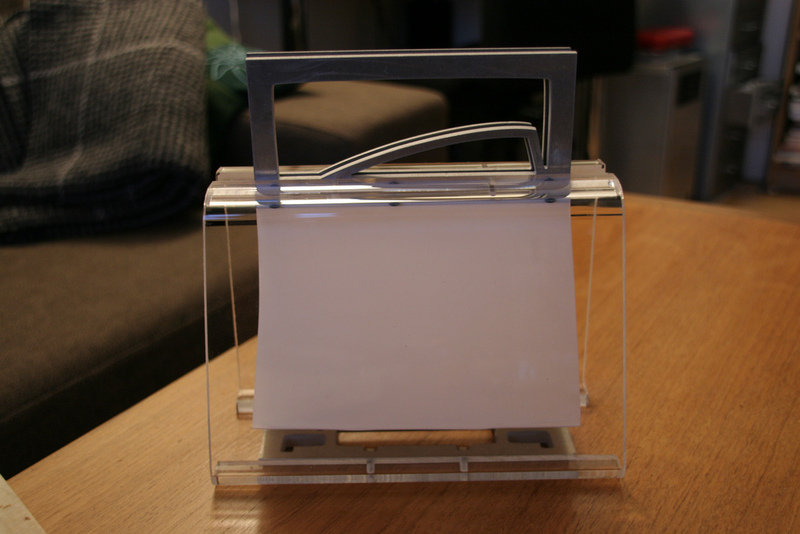 3 mm is not thick/solid enough to attach hinges and handle, but can be fixed with a 8×8 mm square bolt glued to the purse. In the mean time, I’m having fun folding plastic. This material wasn’t very good. It cracks easily, but will do good as a visual and functional test. Re-design the purse, especially the hinges and handles needs a couple of changes. The weight needs to be halved. Learn a 3D-program, possibly Blender, to have something to feed the CNC-router. Design a new graphical look, the shield with the star is old and boring. Previous Post Replace that spare tire fat around your waist with a bike tube?